The company and new product line will both be unveiled for the first time at the National Electrical Contractor’s Association (NECA) Trade Show, in Boston, MA, October, 8-10. The eLumigen booth is number 220 and will feature a raffle give-away of 50 rough service A-lamps, as well as a podcast interview with NECA staff. The first rough service models release include 40W and 60W equivalent A lamps, BR30s, BR38s, PAR30s, and PAR38s. Options include CCTs of 2700K, 3000K, 4000K, and 5000K, as well as 20 degree and 40 degree beam angle options for the PAR lamps. Typical applications for the eLumigen rough service lamps include: construction sites, garage door openers, caged work lights, amusement parks, industrial sites, auto repair shops, work shops, boiler rooms, elevators, and fully enclosed fixtures. 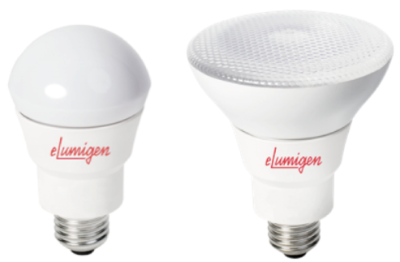 eLumigen lamps are designed and manufactured in North America, improving stock reliability. A strategic partnership with Lear Corporation, a Fortune 500 manufacturer of automotive electronics, provides eLumigen high quality, reliability and on-time delivery to its customers. Gerry Fedele, eLumigen President & CEO states, “With a longer lifespan, increased energy efficiency and unrivaled durability, eLumigen lamps deliver reduced cost of ownership in harsh environments.” In 2017, the company plans to launch 75W and 100W equivalent rough service lamps, as well as an LED line to replace HID lamps. To learn more, visit www.elumigen.com or emailinfo@elumigen.com . eLumigen is a manufacturer of premium performance LED lamps, including an industry-leading line of rough service LED lamps. eLumigen products are proudly designed and manufactured in North America.